When I was growing up, Thanksgiving meant being around family… lots of family. In both of my Dad’s and Mom’s families, we had cousins by the dozens. Thanksgiving was always spent with my Dad’s family. By the time you counted grandparents, great aunts and great uncles, aunts, uncles, cousins and so on, we numbered over sixty for dinner. On Thanksgiving Day, I remember being scrunched in the back seat of a ’62 Pontiac or ’64 Chrysler in between three of my brothers, the fourth was in the front seated between Mom and Dad. I’m sure they heard, “are we there, yet?” a number of times. Turkey dinner was 90 miles away. So, to pass the time, we would play a game we called, “Zits,” which consisted of scanning the passing pastures for white horses. Upon seeing one, we’d call out, “zits.” Sometimes, we would drive for a long time through the Nebraska countryside without seeing any animals of any kind. We would pass farm after farm along the road, roll up and down the occasional steep hills, and stare out at the vastness of the heartland. As we studied the surrounding hills, we’d spot a deer or two, and maybe even an eagle. It was kind of like we lived out the song lyrics, “over the river and through the woods to Grandmother’s house we go.” We would pass through the various small towns along the highway that paralleled the Missouri River: Niobrara, Verdel, Monowi, Lynch, Bristow, and Spencer. When we finally rounded the last curve northward toward Butte, a town of 500 hundred people, my heart would jump with excitement! Mom always got up early on those mornings filling the house with the aroma of a number of dishes she’d prepare. She’d always have a some sort of main dishes, a vegetable or two, and a dessert. She would bake bread, too. I’m afraid I didn’t get the baking gene. I’ve never been one to don an apron on a regular basis like her. She was always looking for a recipe for something. While she was a busy in the kitchen, my Dad and a couple of my brothers would go hunting at the break of dawn. They’d return with a couple pheasants and get ready for our family journey. I loved being with my cousins, as well as seeing my grandparents and all my aunts and uncles. We gathered in the church’s dining room, as that was the only place large enough to hold all of us. After dinner at the church, we would head over to various relative’s homes. I recall watching Nebraska football on Thanksgiving Day. The game was usually against Oklahoma… our biggest rival. Of course, nobody went anywhere until the game was over! If only we had Facebook, Instagram or Twitter back then. My goodness, we would have plastered cousin selfies and Go Big Red tweets all over the place!! This annual tradition goes back as far as I can remember in the 60’s and 70’s. And even when we all left home to go to college, we would return for the holidays and make that same 90 mile trek, however our ride got upgraded to a Van (with mood lights). We would eventually move away to pursue various careers and have ended up all over the country. It’s been over a decade since I’ve been back to that part of the country, but there’s a special place in my heart filled with many happy family memories. Today, I am looking forward to my sons returning home from college to celebrate our Thanksgiving together. The family gathering isn’t large like it was when I was young, but the tradition is still just as sweet. I am grateful for the family that God gave to me, especially my sons. They are the best gift I could ever receive. God gave us each other, to love and to care for one another. We are truly blessed. Gathering together with family at Thanksgiving is a wonderful tradition. God has blessed my family richly. I am grateful to God for where I was born and the family I grew up with. It is an incredible heritage, indeed. I can’t say that I miss a 90 mile journey for dinner, but I wouldn’t mind playing “zits” once in a while. Maybe, someday I will play that game with my grandchildren. I’m thinking it will be a welcomed tradition. 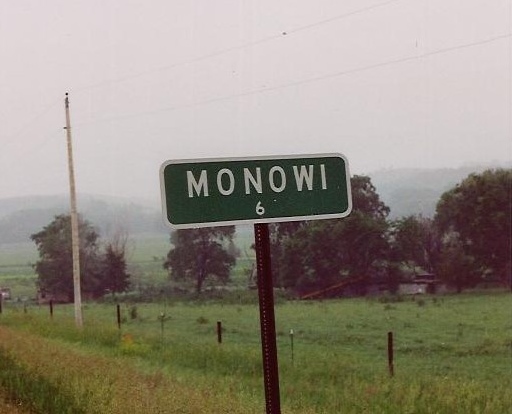 *When I was growing up, the town we drove through named Monowi, NE had a population of 6. Now, it has only one resident, the mayor.